Compare holidays and travel extras fast! Looking for a great travel deal to Benidorm Spain? Compare prices today and save on your next Costa Blanca Benidorm holiday. Book a Benidorm hotel, Alicante flight, Car Hire and buy cheap Travel Insurance. 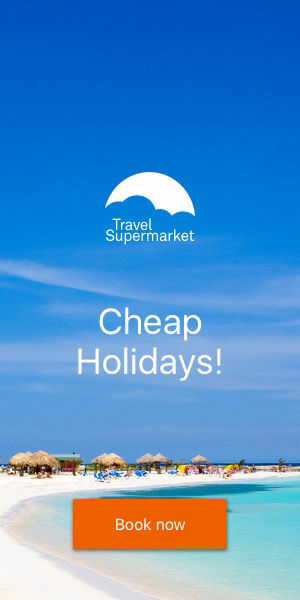 Travel Supermarket are the UK’s leading price comparison service for package holidays. They compare thousands of package holidays from over 25 leading travel companies. Compare travel prices, save lots of time and some money too! ATOL: All the holiday companies are protected by ATOL giving financial cover should a travel company cease trading. HOTELS: Benidorm Hotel only bookings are compared with the leading bed booking providers in the UK and worldwide to find B&B, Half Board and All-Inclusive cheapest room rates. DEALS: Last minute bargains can be seen side by side so that you can easily find the lowest price for a late deal to Benidorm and the Costa Blanca. When top UK holiday companies have a sale, you will be sure to find ALL the discounts in one place. TRAVEL INSURANCE: Find the best value holiday travel insurance from 400 policies and top UK insurers all in one place! CAR HIRE: Compare prices for car hire from Alicante airport or collect from downtown Benidorm. Filter by rental company, fuel policy and car size with one click. BIG ON HOLIDAY CHOICE - Because Travel Supermarket compare prices from more than 25 leading holiday companies and hotel booking sites you get more choice and more cheap prices than anywhere else! HUGE ON HOTEL DEALS - By comparing hotel rates from lots of top selling bed booking websites you are sure to find the right hotel at the right price and the best board basis on your next Benidorm hotel or apartment. FAST FOR LAST MINUTE - Booking last minute can be time consuming! Travel Supermaket checks the final prices with all the top holiday companies to find you the lowest priced holidays available if you want to travel soon. If you prefer you can book just a low-cost flight then book a cheap hotel separately for even more flexibility!